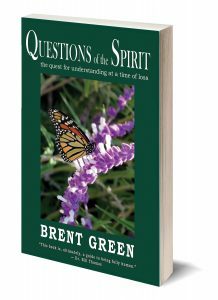 Questions of the Spirit by Brent Green, "his sixth and best work." Brent Green began his career as a rehabilitation psychologist then transitioned to advertising and marketing communications. 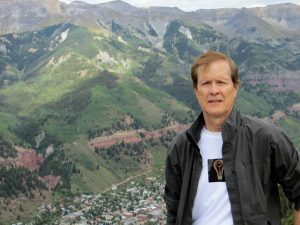 Today he is a creative director, author, speaker, and trainer specializing in Baby Boomers, the generation born from 1946 through 1964. He established his international platform with Marketing to Leading-Edge Baby Boomers: Perceptions, Principles, Practices, Predictions (PMP, 2006). His most recent nonfiction book is Generation Reinvention: How Boomers Today Are Changing Business, Marketing, Aging and the Future. He has also written two literary fiction books entitled Noble Chaos: A Novel and WARRIOR: The Life and Lessons of a Man Who Beat Cancer for 57 Years. Brent has served in a leadership capacity with many professional and public service organizations, including as board member and chairman of the Colorado Springs Convention & Visitors Bureau, board member for Junior Achievement, and as programming vice president for the Business Marketing Association and the Rocky Mountain Direct Marketing Association. He became the primary caregiver for his parents during their final eight years, while becoming familiar with assisted living, nursing homes and hospice. Both parents received hospice and palliative care at the end of their lives, as did his sister and only sibling. Brent is a popular keynote speaker focused on Boomers, business, and nonprofits. His previous speeches for hosting organizations connected to themes covered in this book include the National Hospice Work Group, the New Mexico Association for Home & Hospice Care, Florida Hospices and Palliative Care, and Community Hospice in California. He also provided in-depth color commentary for a PBS hospice documentary entitled Except for Six. Established in 1986 and based in Denver, Colorado, Brent Green & Associates, Inc. develops marketing communication programs with emphasis on direct response media, integrated promotions, marketing public relations, and executive leadership training. The firm has received over fifty regional, national and international awards for creative and strategic excellence—most notably, the Direct Marketing Association’s International Gold ECHO Award, the highest distinction in target marketing.